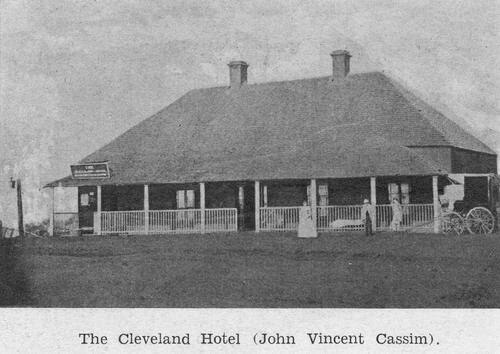 John VIncent Cassim ran Cassim's Family Hotel and Boarding House (now the Grand View Hotel) from 1855 to 1860, leasing the property from Francis Bigge. He left after building his own hotel, the Cleveland Hotel, on land situated not far from his former digs, purchased in 1858. Here is a photograph of it, unfortunately not dated. Cassim, who was from Mauritius and of Indian heritage, became quite a local identity. He arrived at Moreton Bay penal colony in 1840 as a convict and obtained his ticket of leave in 1844. He and his wife Mary operated a boarding house at Kangaroo Point between 1851 and 1855, then moved down to Cleveland. Although Bigge's venture into the hotel industry was unsuccessful, an increasing population around the Cleveland area did allow not only Bigge's former hotel (now called the Brighton Hotel), but also Cassim's new Cleveland Hotel to thrive. By 1863, Cassim had a bathing house, jetty and coach house as enhancements to the property. Following the death of John Cassim's first wife and then his own subsequent death, the hotel remained in the hands of his second wife until 1916. The building was renovated in the early 1920s, but was storm damaged in 1929 and fell into disrepair. The building was converted to use as flats just after WWII. 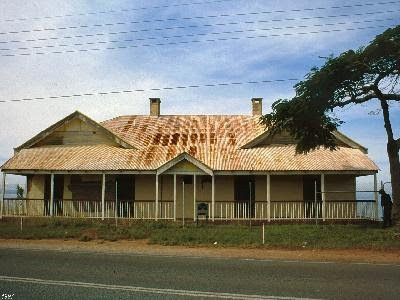 In the photo above, which was taken in 1997 when the building was again in poor condition, the changes to the roofline and verandah are evident. But now there has been some progress - in 2000 a restoration project took place, as evidenced below. The building now appears to be commercial office space, and in a nice touch, it has been named after the original owner. Initial stages of the restoration were started by Neverfail Construction in 2000 by Darren Jonson and George Hill.